A tragic motocross accident left G.L. Woods instantly paralyzed from the neck down. The events that transpired from that day forward would have been impossible to foresee. 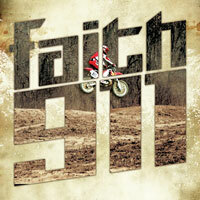 Read the tragedy to triumph story in G.L.’s new book “Faith 911”. Stay connected with G.L. Woods. Read featured newspaper articles about G.L., connect with him on facebook or take a look at his calendar for a book signing or speaking engagement near you. We always want to stay connect with you and hope these are just a few ways we can help you do that. Learn, connect and read more about G.L by clicking the button below. Is G.L. coming to speak at your next event? Download flyers, posters, bulletin inserts, press releases, listen to radio interviews and more. Help spread the word at your next event or the friend next door. Whether you are hearing G.L. 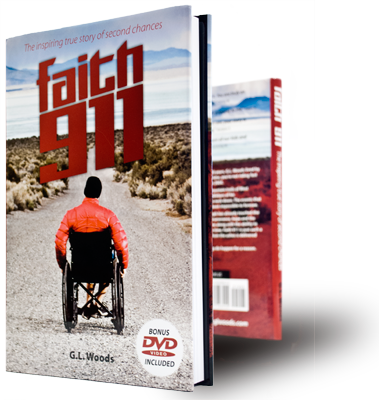 tell the story for the first time, or have a copy of his book and DVD, let’s spread the word about “Faith 911”. “As I travel and speak each year at various venues, inevitably someone approaches me afterwards saying, “I really wish my friend/relative could have heard this incredible story. 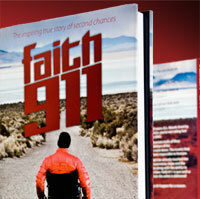 They are struggling physically/spiritually, and your powerful message could make a real difference in their lives”. It wasn’t long before I realized that EVERYONE knows someone who is hurting.